I am having a quiet Saturday night at home, in my craftroom, listening to music, I guess this is what Happiness is... Happiness is, also my participation at Magnolia-licious first color challenge, Pink and Yellow. I have been thinking about this card all week, until I found this paper, I had no idea what I could create. Pink, no problem, I am a pink girl. But yellow is a color I am having problem connecting with, although I love yellow.. Then came a recipe book on cupcakes. I love cupcakes, it is a pleasure for me to bake cupcakes, sit down with a cup of tea, and enjoy this delicacy! It inspired me, because it was full of images of yellow and pink icing! This is the story I wanted to illustrate with my card. I chose Happy Tilda that I bought a while ago from Magnolia-licious, she is colored with Copics. I received the image ofthe cupcake from a friend who has this cute stamp, I colored it also with Copics, but in lieu of the icing, I used Liquid Pearl, in Petal pink, then I added glitter and pearls. I cut the Magnolia doily in a pink glitter cardstock. The lovely banner is makde with my Cricut Reminsce cartrige. The letters are from Quickutz alphabet Studio Skinny mini. The DP is from Creative Memories, Enchantement collection. Thank you for stopping by, and take time to enjoy what Happiness is for you this weekend. Merci de venir me visiter. What a delightful card. Love all the sparkle. Very Pretty Card. I can't resist a cupcake either. all the sparkle and your coloring. that is just to darn cute ! You make the sweetest cards. Oh Danielle! This is adorable!!! How could anyone look at this card and not get a big smile on their face!!!! I love all the sparklies and Tilda is so beyond cute! Fabulous card!! Love the design you have chosen and the coloring is great. Beautiful Card! Happiness for me is Cupcakes! hehe Thank you for joining us on the Magnolia-Licious Challenge Blog!! 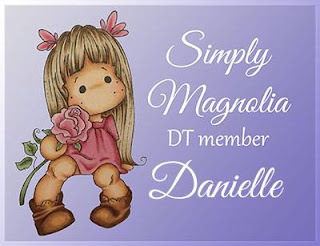 Oh Danielle how smart you are.. to think of using a cupcake and a banner.. would never have thought of that and the glitter is right up my alley.. you did such a great job on the banner with the quote and like I said love all the accessories..
Happiness is....perfect for your card! Love the banner and the glitz. Tilda is adorable along with the cupcake! Terrific job Danielle! Oh what a delightful card so full of joy! :) I love Tilda holding that Happiness Is... banner. So super sweet and beautiful coloring! Très charmante cette Tilda! 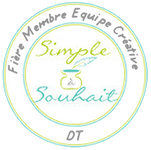 Tout est harmonieux et si délicat! I adore your story and how you incorporated it into your sweet card! Tilda is a very happy girl about her cupcake and her banner proves it!! Your colouring is very pretty and your cupcake looks good enough to eat ( love the pearls on top ) . Thanks so much for joining in our first challenge at Magnolia-licous Challenge Blog. Now doesn't she just look like the happiest kid on the blog? I love the cupcake theme (true happiness is the sweet frosting) and your sparkles look so fabulous here. This card is sheer delight! WOW, Danielle, this is a magnificent card!!!! You created a phenomenal scene and a most beautiful card incorporating those colors. Love the cupcake theme......I can definitely relate to that....just had a cup of coffee with a cupcake...Yummmmmmmyyyyy!!!! bravo elle est superbe ta carte, tu as très bien relevé le défi d'ajouter du jaune. Danielle, a lot of ladies seems to be of the same mind re the challenge colours. The pink is just fine, but what do you do with the yellow…LOL. Well I think you’ve done a fantastic job of rising to the challenge. Your card is fabulous. I love your Happy card and I like the story behind the card. TSF. And who doesn’t like cupcakes!!! Thanks for joining the fun with our first challenge a the Magnolia-licious Challenge Blog..
Gorgeous card! Love everything about it. Beautiful card! I love the image and papers.